A modern road has made the monasteries accessible to tourists, but a pilgrim may still ascend more deliberately on the old wooded paths leading up from the lowlands. The way is peaceful and full of birdsong, and the upward views of immense cliffs and towers crowned with such fanciful habitats were continuously astonishing. At the top, the hiker joins the throng who have arrived in bus or car, often to find a prevailing atmosphere of chatter which neglects or obscures the beauty of holiness. People wave and smile at cameras, offer the same brief glance to Christian images which they gave to Athena and Apollo in the Greek museums, enjoy the spectacular views, and head off to the next attraction. It doesn’t always feel like pilgrimage. And many of the monks themselves have long since fled to more solitary retreats. But patience may be rewarded, and today there were fortunate lulls in the touristic turbulence, when the worship spaces emptied out and prayerful attention was possible. The priestly preface to a guidebook published by one of the monasteries wishes the pilgrim “a rare spiritual journey between heaven and earth, in order to “taste here newfound bliss, spiritual uplift and powerful emotions” providing release from daily routine. And I can testify to the tangible effect of a long and dramatic wilderness ascent to arrive in a room, lit only by the soft daylight falling from a few small, high windows, and there be immersed in a sepulchral interior filled with icons and hanging lanterns, where every wall is painted with frescoes of saints and biblical scenes. It feels like a space praying ceaselessly in story and image, bearing witness to the Divine Mystery until the end of time. The images are painted in bright colors, which stand out intensely against their ink-black bakgrounds, so strikingly different from the familiar golden environments of most Byzantine iconography. This distinctive style came from Theophanes, a fifteenth-century Cretan artist who worked here as well as at Mt. Athos. To a modern viewer, for whom the gilded world of faith is no longer a given, the blackness suggests a void against which the existential cry of “let there be light” must ever be a proposal fraught with risk. 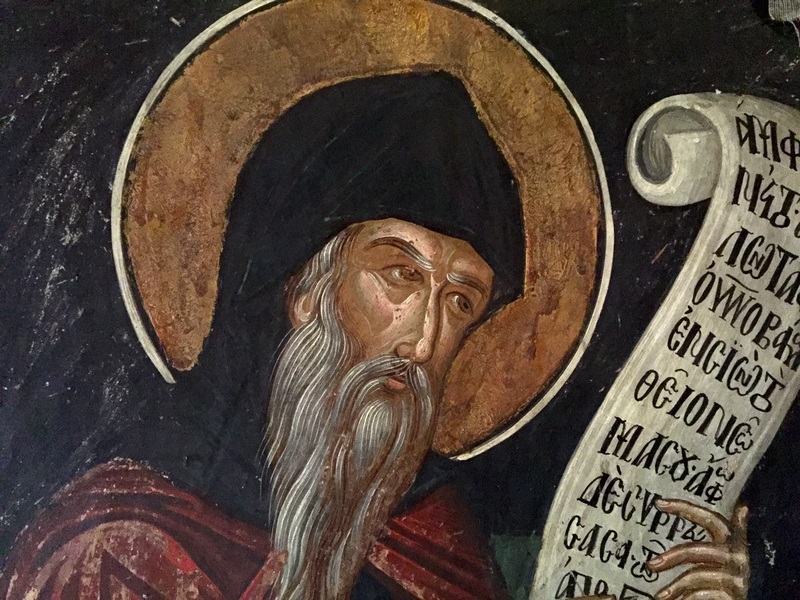 The holy paintings of Meteora, like the Christianity that produced them, have suffered fading and wear over the centuries, and some of their meanings have grown obscure. But unless a grain of wheat should fall into the ground and die, it cannot bear any fruit. 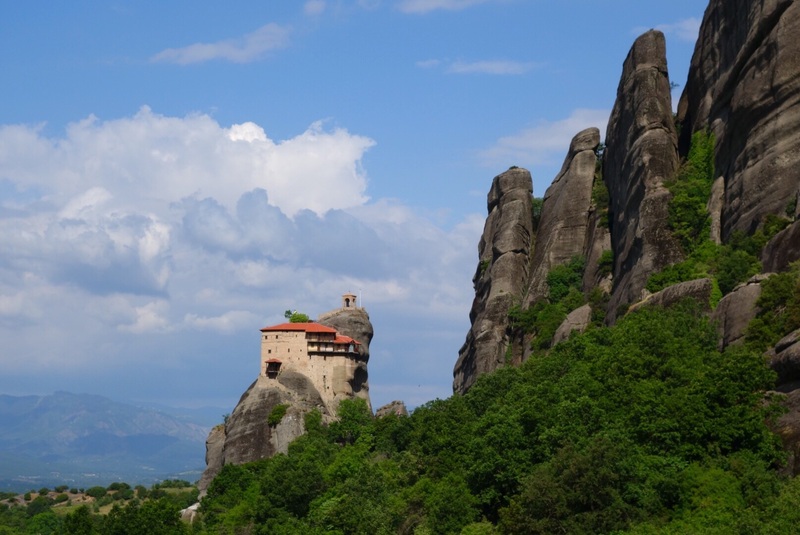 This wondrous day ended with a visit to the oldest Byzantine cutch in the region, built not at the summit but at the foot of the Meteora rocks. It was empty of visitors when my wife Karen and I arrived at sunset. Before leaving, I asked the Greek woman who collected admissions if I could sing a Kyrie in the resonant space. I’m not sure she understood exactly what I was asking, but she seemed agreeable enough. I stepped into the nave and began. The Kyrie I chose was an ancient Greek setting. She recognized the chant and began to sing along somewhere behind me. Orthodox and Anglican, Greek and American, female and male, praying together amid the cloud of painted witnesses all around us. “She had tears in her eyes,” Karen told me later. As we took our leave, I said the Greek acclamation for Easter: Christos anesti! Christ is risen! “Alithos anesti,” she replied with a smile. Indeed he is risen. 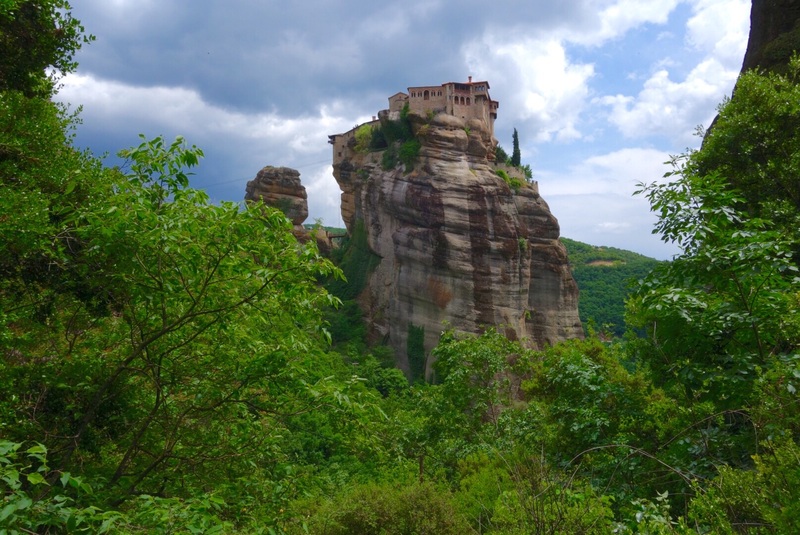 This entry was posted in Anglican spirituality, Greece, Monasticism, Religion and tagged Byzantine monasticism, Christian worship spaces, Frescoes by Theophanes of Crete, Monasteries of Meteora, Orthodox Christian painting, Pilgrimage and tourism by jimfriedrich. Bookmark the permalink.